A seven year old's birthday is a super special occassion. This special 7 year old has a new baby sister who is only 10 days old. I am so thankful for Birthday in a Box to help make this birthday party easy for me! They have a huge selection of birthday supplies in all themes. My 7 year old is a huge batman fan so we opted for a Batman Party complete with balloons, cups, plates, napkins, silverware, decorations, centerpiece, masks and even candles. The only thing I needed to add to it was the cake! I was able to make his birthday super special despite having a new baby. Birthday in a box is a must for all of my kids upcoming birthday parties. The prices are really reasonable and you can find just about any theme you can imagine. I live in a small town and we only have one store that would even carry birthday supplies. Their selection is very limited to what is popular right now, and batman wasn't one of them. We took the mylar balloons that were included to our local store and they put helium in them for a small fee. The huge Batman balloon was a hit! Learn about Batman's History and share it with your batman fans! We strung up the crepe paper and banner and our birthday party was staged. We even tried to make the new baby join in the party! Birthday in a Box was a huge success! I couldn't have been any more pleased with the supplies it came with. We literally had everything we needed. So stress free! Kimberly House luxury linens, natural fiber, and hand embroidered. Their baby line is exquisite! We reviewed this beautiful sleepsack in rosebud pink. At three months old my daughter is already an expert at kicking off her blankets and covers at night. We have had record low temperatures in KY this winter, and it is not the time to be doing that! The Gordonsbury sleepsack is like a baby sleeping bag. She can't kick it off, but has plenty of room to stretch and move to her hearts content. We have pajamas that are simply made of a thin cotton that are a sleep sack idea, but they still don't keep her as warm as I would like. This is a heavy weight, 100% cotton sack has a zippered bottom with snaps at the shoulder for easily accessing the baby while she sleeps. I tend to have to change her diaper midway through the night, and the zippered pouch makes it easy to do without disturbing her sleep. This sleepsack is for babies up to 6 months, or when they outgrow it. I plan on keeping this around for grandbabies for sure. The embroidered details are reminiscent of the old days when people took the time to handcraft gowns for their their babies. The roses are perfect and so tiny! Kimberly House has a complete line of gorgeous bedding and linen for your baby. Delicate and warm just as you would want for your precious bundle. This bedding by Gordonsbury is heirloom quality. Your little one will pass it on to her baby, and grandbabies after. It is just that great of a quality! 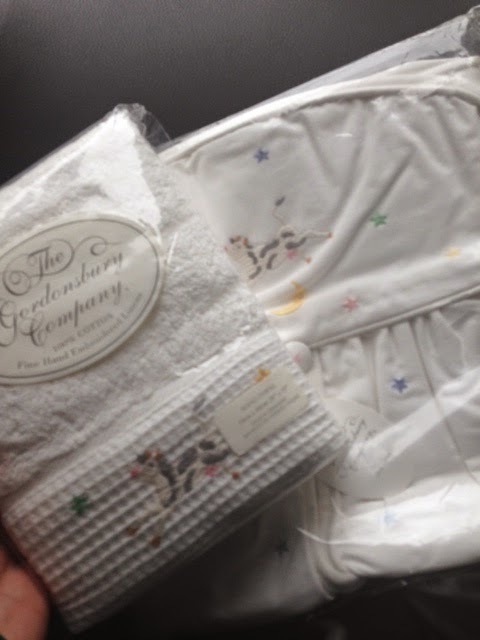 I have a wonderful giveaway for you which includes a Nappy Stacker and Guest Towel from the Hey Diddle Diddle nursery rhyme line. Enter to win these Heirloom Products! 1. I have 3 extra teenage boys spending the night tonight to celebrate my 16 year olds birthday. I have 4 of my own so that makes 7 total teens in the house! 4. 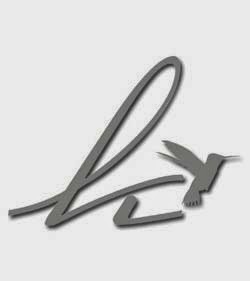 My blog numbers are low... Finding it hard to keep up still but looking forward to getting a few reviews done this weekend and joining in a few blog hops. G. A. Henty wrote 120 books in his time, all with historic significance. His tales tell adventures about history that young people have enjoyed for years. In Freedom's Cause we see Wallace struggling to free Scotland from the clutches of England in the late 1200's. He was a man who fought with valor and dignity, girded in the knowledge of God. I loved how Wallace sought out God and used Scripture in his message. I shared this story with my family. We tried to multi task while listening but I wasn't able to do that. It was so action packed and moved so fast that I soon got lost and had to 'rewind' to start over. It isn't a 'light listening' where you can do much more than color or draw while listening. It is 2 1/2 hours in length and best broke up into 1/2 hour sections. It got long for my 7 and 10 year old and couldn't keep their attention. Unfortunately my family isn't big into history, and I had hoped this would excite them, but it didn't. As an adult I have much more interest in History now and I found it exciting to listen to. My older teens listened as well and were able to pay attention and keep focused. I know many people like to listen to audio drama in the car and this may be a great one for long trips. Hopefully the driver can multi task! I think I could listen to the entire thing if I was on a long trip like that. I just have a hard time sitting still for more than 1/2 hour at a time. I downloaded the study guide and it looked like it would really make the story more memorable and useful as a history lesson. I couldn't capture the kids attention with the study guide, but I enjoyed looking through it. I think if my kids were more keen on history it would be an excellent accompaniment to the CD's. 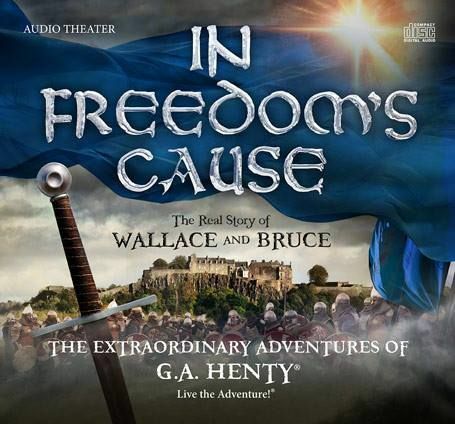 In Freedom's Cause would be a great addition to a study on Scottish History, Heroes who garnished their strength from God, or G. A. Henty study. Great Commission Films presents IndoctriNation Public Schools and the Decline of Christianity in America on DVD. This 102 minute DVD for $19.99 is best suited for adults and older teens due to some material being inappropriate for young listeners. I have had the book of the same title for a couple years and really enjoyed it. The book is great for current home schoolers to energize and refresh their thoughts, but most copies won't reach the ears that truly need to read it. The DVD is so much better suited to target a variety of audiences. I may have a chance of getting a Christian friend who sends their child to public school to watch the DVD, rather than take the time to read the book. So who is the target audience for IndoctriNation? Gives us facts to share with friends and family who currently have children in the public school system. I believe the target audience would be for those who may be on the fence about home schooling. Those Christian parents who need some facts and insights into what truly is happening in the public school. I would hope that all Christian parents with school age children would watch the film. I think some of them would be offended, but I hope in the same note they would feel a sense of conviction. IndoctriNation follows Colin Gunn and his family as they take 3 months in a school bus and travel to the country. They hit the states of TX, PA, NC, NE, NY, VA, MA, IN, DC, SC, IL,TN, KY, WV and CO while interviewing teachers, pastors, principles and students. Colin Gunn utilizes news broadcasts, scenes from schools, and interviews to dig into these indoctrinating topics. Wasn't our country found on Christian values? What happened to those values in the schools? The Puritans came to America to find that liberty to use the Bible to educate their children. The New England Primer utilized the Bible to teach the alphabet to children. These schools were grounded in the Word. The first actual public school however, was not. Horace Mann was the first to start a centralized, state funded, compulsory, forced education which was patterned after Prussian Germany. The system was very similar in thoughts to those of Karl Marx, not Christianity. To reclaim our schools and 'take them back' would be pointless as they never started out as 'ours', in the Christian sense. What happened to learning math and reading? Seems from watching this DVD that the focus in the school is to train the future generations to be servants of the state. The academic levels of the schools continue to disintegrate. Pastor Voddie Baucham Jr mentions that 90% of Christians make the same decision on one item.. educational choice. They fight over the right version of the Bible to use, and on what denomination is better. They are united in sending their children to public school though.. yet there is no book, chapter or verse in the Bible to justify that. Wow! I'm obviously already swayed to home schooling. The movie encouraged both my husband and I that we are definitely doing the right thing and we will continue to focus on training up our children in the values we hold rather than the indoctrination that the government is so bent on convincing our children of. With DVD in hand I plan on sharing with those God leads. There are people who need to watch this, who are wondering about the schools and haven't been able to get answers. Colin Gunn doesn't put on blinders to the truth. I pray that this DVD gets into the right hands and that more parents make the grand exodus from the public school system. Keep up with the latest on IndoctriNation by visiting these social media sites. Cheeky Chompers will delight your infant with the Comfortchew. This teether with adorable "Chewy" the hippo is perfect for your little one. The hippo is BPA and phthalates free and is perfect size for the munching little one. The ribbon tags have always been a favorite with my young babies! Perfect for any size baby to work on those fine motor skills of gripping. The light gray background has fun safari animals, and the back is a nice soft gray fleece. It has an elastic link to attach to your car seat or toys so baby doesn't throw it on the floor. The Comfortchew comes in 3 other designs with "Chewy" as the teether. So cute! Machine washable which is a huge plus! This is going to be a favorite for my daughter I am sure. I love that two Mamas started Cheeky Chompers, as they surely know what little ones like! We love to sit and snuggle on the couch and read awesome books in the winter! With the sun setting so early, and the cold nights, there isn't anything better than snuggling in for a long winter's nap! I love the illustrations in this book! The colors are great with the emphasis on red, black and white. I really enjoy this style of illustrating. Louise is always drawing, she says "So little time, so much to draw". 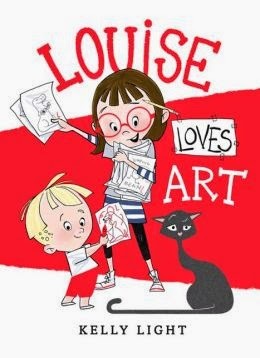 Louise is setting up her art show in her house, and her brother Art just wants a little attention. He accidentally cuts up her masterpiece into a beautiful paperdoll. What an awesome big sister! She is upset of course, but she puts her little brother first before her love of art, and that is just beautiful!! The abbey's novice master confirms the boy's identity; it is John, one of three novices. He had gone missing four days previous, and yet his corpse is fresh. There has been plague in the area, but this was not the cause of death—the lad has been stabbed in the back. 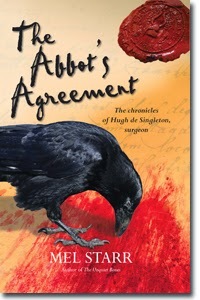 To Hugh’s sinking heart, the abbot has a commission for him. This series is one of my favorite. Hugh de Singleton, bailiff and surgeon is a witty guy. I actually chuckle out loud when I read these books! Mel Starr is well versed in old English and Medieval times, making the story very realistic. You read it and are sent back in time with the characters! There are many characters, with monks and townsfolk and on occasion I would have to back up to see which person was a good guy and which ones weren't. Some of their names were kind of similar. You don't read this book quickly in a speed reading fashion.. you will miss things! FACT: Heart disease kills nearly 600,000 people a year, making it the leading cause of death in the United States. February’s Heart Health Month is the perfect time to reflect on your health and start making “heart healthy” lifestyle choices. What you decide to put in your mouth can have a huge impact on your heart. A healthy diet can be as good for your heart as it is your waistline and you might be surprised at some of the top heart healthy foods. 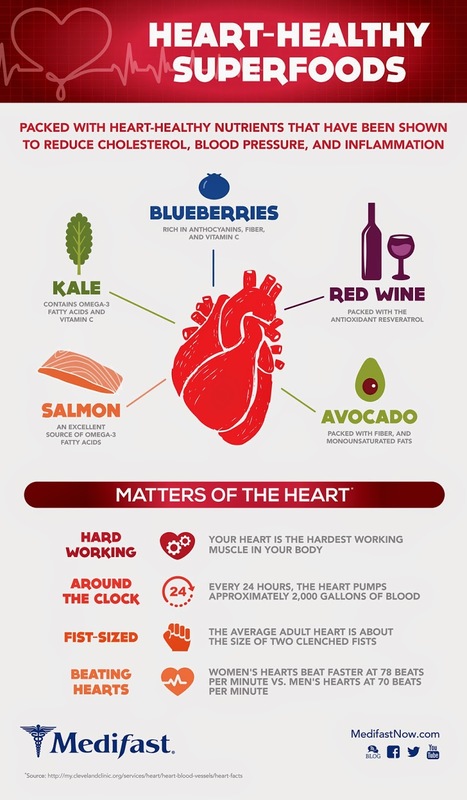 With the below infographic from Medifast, you can get a jump start on heart health and enjoy five top superfoods! As I am getting older, and dealing with some medical issues, info like this is priceless. Just think about what you are putting in your mouth and how that is impacting your health. Women are just as likely to have heart disease, we aren't exempt!! These 5 superfoods are a great way to get started in reducing cholesterol, blood pressure and inflammation. What is your Bizarro Name?? Jen-Crush-Zarro-Mecca! Type in your name to reveal your Bizarro alter-ego - If you don’t like your name, press the refresh button or try again! Enter to win the Blue-ray!